Jun. 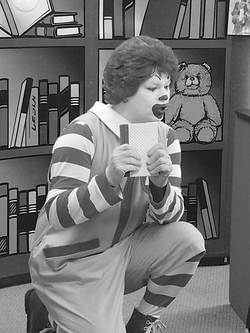 14, 2013 6:00 a.m.
Ronald McDonald started his day in Wetaskiwin with a trip to the library where about 30 children with their parents gathered to see him. He got down close and personable as he kept the children's attention as he talked about reading, care of books, read a story, and talked about libraries being free, and that school children can go to two libraries, the public library and the school library. Ronald McDonald visited Wetaskiwin the morning of May 17, beginning with a session at the Wetaskiwin Public Library where he skillfully held the attention of about thirty preschool children, with their parents, while he talked about reading, how to care for books, read a story, emphasized how libraries are an important free access to books, and told how children in school have access to a second, school, library. He impressed with his excellence and rapport with the children. From the library, Ronald McDonald went to the main McDonald's in Wetaskiwin where he presented cheques to three charities. McHappy Day in Wetaskiwin and Camrose raised funds for the Special Olympics. Wetaskiwin, partnered with Rick Hanson, raised $3,197.48, an increase of 10% over last year. Camrose had a 30% increase over last year for a total of $4,357.74. Funds raised through operations promotions and certain sales provided $7,555.21 for Ronald McDonald House in Edmonton, the home away from home for the parents of out-of-town patients at the Stollery Children's Hospital. Again, Ronald McDonald impressed with his skill at meeting and greeting people and putting them at ease.